I don't usually think of myself as a person adverse to changes. I really like to go to new restaurants, towns and have new adventures. But, tooooo many changes at once can just be a little overwhelming.... AND exciting! Here are some great new changes going on around here. Learn How Jen-A-Fusion Does it! 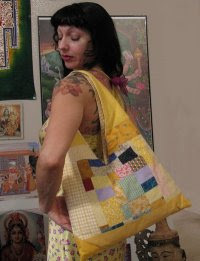 I'll be teaching a workshop about how to create a bag from recycled fabrics, old clothing, your favorite dress, vintage towels and more. Learn about suitable fabrics, patterns, interfacings and other materials. Basic sewing skills needed. Plenty of free materials provided along with sewing machine usage. Instructor will provide a suggested supply list prior to class. Advance registration is required by Tuesday, March 9 at www.thedelrayartisans.org. Fee is $40 for DRA members / $45 for non-members, this includes many materials! Well... perhaps this does describe this hidden little gem. Tucked in a seemingly innocent tiny strip of shops, this great store might hoodwink one into thinking it was just another gifty shop. So not so! Bamboozled is a hard store to describe. Part exotic clothing boutique, part baby shop, part jewelry book, this shop defies description. It is in this light that I am so happy to be carried there! Stop by to check out the little zipper bags and coin purses they now have on hand.